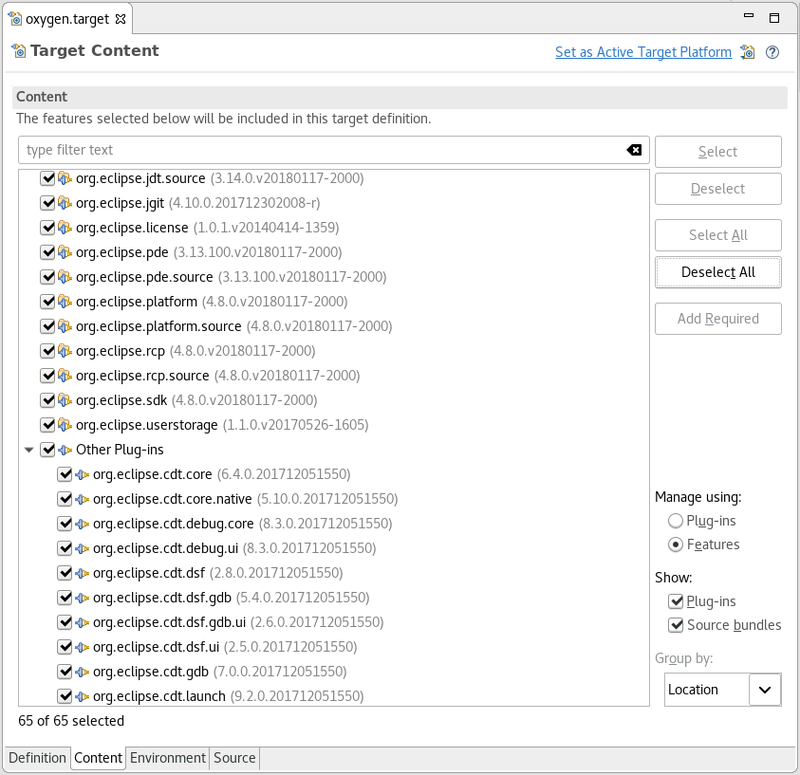 The Content Page in the Target Definition Editor is used to view and edit the set of plug-ins to be included in the target definition when set as the active target platform. The definition must contain one or more locations containing plug-ins and the definition must be resolved to edit the content. Only the plug-ins that are checked on this page will be included in the target. There are multiple options available to filter and sort the list to quickly check what you require. Select / Deselect will check or uncheck the selected plug-ins. Select All / Deselect All will check or uncheck all plug-ins in the target definition. Add Required takes the set of currently checked plug-ins and determines all plug-ins required by them. This will also include any implicit dependencies set on this target. The required plug-ins will be checked in the list. Use the Show options along with the filter text box at the top of the list to filter what is shown in the list. Showing plug-ins will show any non-source plug-ins in the target, while showing source bundles will display any source. Even if a plug-in is filtered from the list, it may be included in the target. You can see a count of included plug-ins underneath the list. On the right hand side, you can choose between two different modes to manage the content of the target. 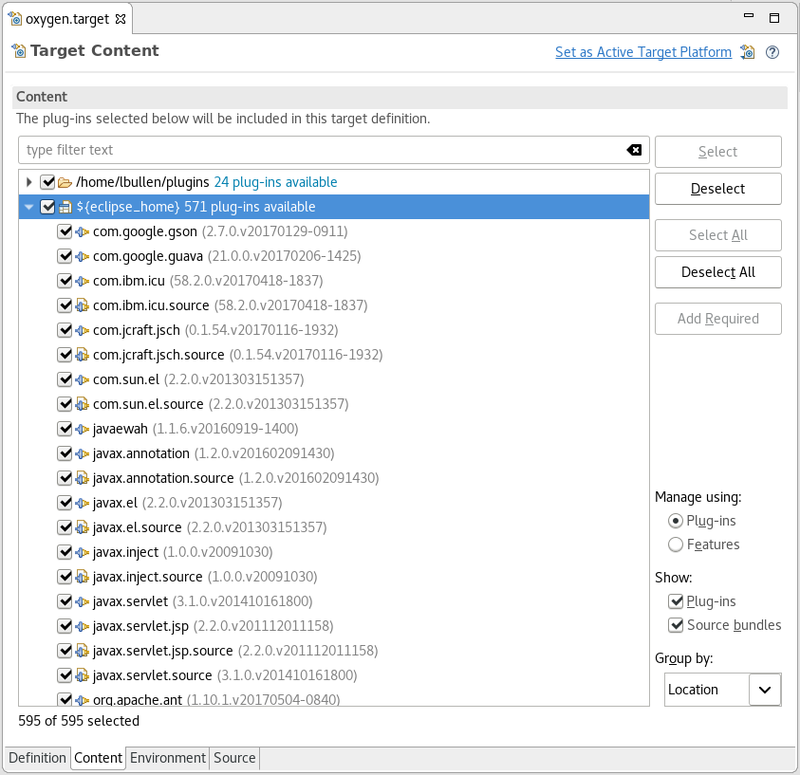 By default targets are managed using a list of plug-ins. Selecting Features will change your target contents to a list of features. You can select features in the same way as when managing by plug-ins. Add Required will select any features that the currently selected features have in their include or require entries. If there are plug-ins in the target that do not belong to a feature, they will be listed under the Other Plug-ins item and can be selected individually.